"If a maid is employed as a cook, she will only be tasked with chores related to cooking and will not be doing any other duties such as babysitting or washing clothes," - Dr Reyna Usman, during a task force's meeting at the Indonesian Ministry of Manpower and Transmigration, Jakarta. In most cases families would take care of the elderly and the more likely scenario is to have maids for babysitting, cooking and housekeeping. By spreading the cost for hiring into 36 months (3 years), it is an equivalent to RM125 per month and add this to the monthly wages of RM2,100 and the employer ends up paying RM2,225 every month for the next 3 years. Is this the scenario you want to put yourself in? No, not for me. RM2,225 can go a long way. I will hire a local who would be happy to do all 3 chores at RM800 - RM900 per month, give the maid a 1 day of every weekend, and I can make use of the remaining RM1,425 to pay for a brand new car of my choice, or pay my home loan. My local maid won't need any passport and I do not have to worry about a maid running away to a better paying employer. Human Resource Ministry partly to blame! The reason why locals are reluctant to become household maids is that there is no salary structure or scheme and no clear employment benefits put in place by the Human Resource Ministry. If there's one, and there is minimum wages for maids then it will become a profession. 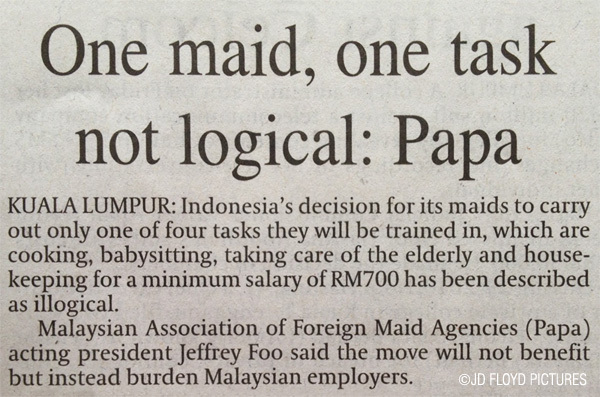 It takes a bold move from other countries for the government to start thinking about solving the maids shortage in Malaysia. Why foreigners? Why not locals? Are we locals really not that interested in this kind of profession? I don't think so. Given the right working condition, and a clear framework for remuneration, anyone would do it. It is similar to the construction and plantation industries. To be fair to the Indonesia government, this may have been the current practice and arrangement with other countries where its maids are deployed to. But if it's not then we have every right to question such move and reject the seemingly illogical decision. If you think locals are hard to deal with, or problematic and lazy, it makes very much sense to look elsewhere other than Indonesia. Berapa pula pendapatan rakyat malaysia sendiri yang buat berbagai tugas? sangat tidak logik dan tidak masuk akal. 1 tugas untuk RM 700. Kerani yang dapat gaji RM 700 buat multi task juga kalau di office. Kalau hanya tugas untuk cuci kain - berapa kali sehari dia cuci kain? mungkin ada hari yang tidak ada kain dicuci kan? so sangat besar kemungkinan dalam sehari amah tersebut goyang kaki lah? Permintaan / penetapan syarat dari Pihak Indonesia agak tidak masuk akal. Mahu bilang, salah perkiraan daripada pihak Indonesia, tapi tidak mungkin. Maybe there's blessing in disguise in all this. Maybe Malaysia need to re-look at the housemaid profession in a different perspective.